Flowers of Hagley Ltd is a privately owned and exclusive Flower Shop and Floral Design Consultancy specialising in bespoke Flower Arrangements, Bouquets of Flowers, Floral Tributes, Wedding Flowers, Plants, Gifts, Cards and Candles. Client focus is the hallmark of Flowers of Hagley and a highly personal touch is closely coupled with good advice and top quality service. 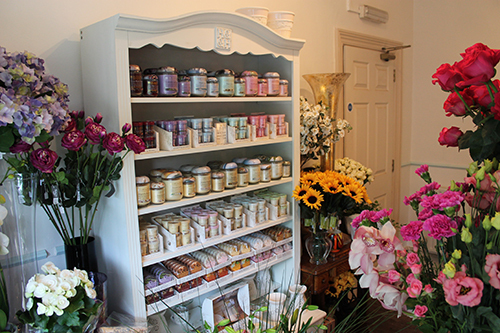 This new shop is the latest outlet for the wonderful floral creations of Julie Leddington who is the driving force behind ‘Flowers by Julie’ – one of the area’s most prestigious bespoke wedding and special occasion florists. As a professional florist and floral designer Julie Leddington will be pleased to provide a comprehensive quotation to fit your personal budget. The Flower Shop at Hagley is stocked with floral packages for every possible occasion. Whether you are looking for a small bouquet of flowers to brighten your home or a full floral display to compliment that very special occasion you need look no further than Flowers of Hagley! The flower shop is fully stocked with floral creations made freshly every day. In addition we are also able to design a bespoke floral arrangement with a very quick turnaround time – all floral designs are carefully hand made on the premises by Julie herself! Our policy is to offer our customers ”Value for money” and, with that in mind, we deal directly with our customers with no additional charges going to other organisations – This means that you get the appropriate value of flowers that you have paid for. Why not pop in to Flowers of Hagley to discuss your special requirements with Julie at a time convenient to you. Visit the Contact Page for opening times and contact details.